This is a great school holiday dinner! 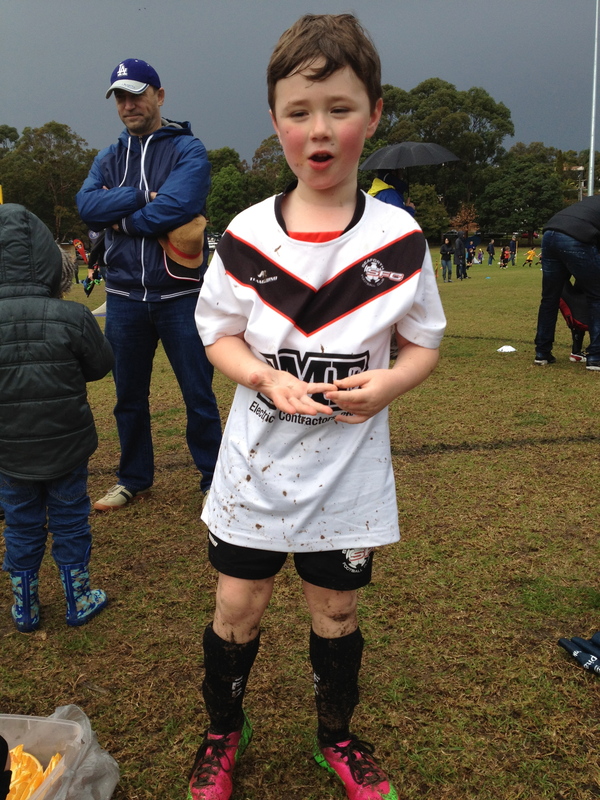 Especially before we head out to watch a game of rugby. The boys had sliced leg ham in their sandwich and the grown ups had prosciutto. I was a bit sceptical about the bechamel sauce, I’m not a fan of it. However this time I could see that it added a creaminess to the sandwich that I really liked. The recipe in David Lebovitz’s My Paris Kitchen requires you to place cheese on top of the grilled sandwich and then grill it a second time in the oven. I just couldn’t add any more cheese! I used Emmenthal cheese for the adults and Jarlsberg for the kids. It was simple, delicious and very satisfying. I also made the vinaigrette and tossed it through some radicchio and baby cos leaves. The sandwich was salty from the cheese and prosciutto and the vinaigrette provided a sour kick from the vinegar and mustard. I needed something to cut through all the salty sour flavours. I added a tablespoon of brown sugar to the vinaigrette recipe and this really did the trick for us. I am looking forward to reading what everyone else in the Cook The Book Fridays group thought of this week’s recipe! Tags: cook the book fridays, cooking, family, food, french food, ham, sandwich | Permalink. I was pretty much raised on Tzatziki. My mum made it ALL the time. So I was pretty excited to see it was this week’s French Fridays with Dorie recipe! It was comforting to finish the day with a simple meal. 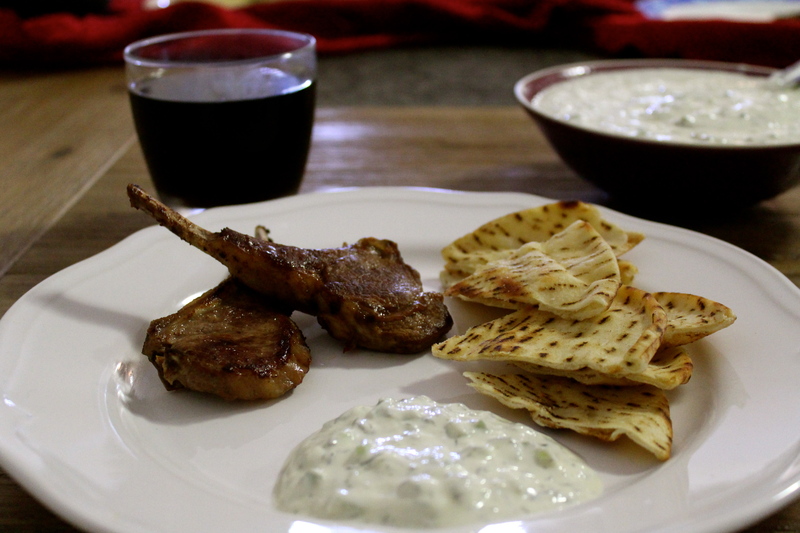 We paired Dorie’s Tzatziki with lamb cutlets and some grilled pita chips. 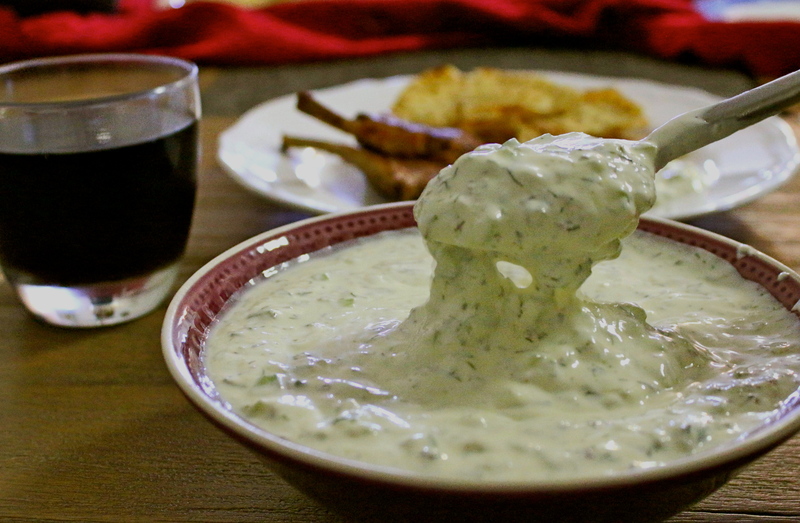 We really, really liked Dorie’s tzatziki! And by accident I stumbled upon a recipe by David Lebovitz for tzatziki that seems pretty similar if you want to try it for yourself… just substitute the olive oil for lemon. I am looking forward to reading what the rest of the French Fridays with Dorie group thought of this! Tags: cooking, family, food, french fridays with dorie, my life, recipes, tzatziki | Permalink. The Savarin, a yeasted bread cake saturated in sweet syrup, pear eau-de vie (brandy), filled with whipped cream and topped with your choice of berries. This week’s Tuesdays with Dorie: Baking with Julia recipe. And I think it would have been simple if I didn’t leave it till the very last minute. Which also happened to be the weekend I was having 5 of my son’s friends sleep over for his birthday. They are loud, they squeal, they argue, they burp, they fart, they tell each other they stink, call each other names, wrestle each other to the ground, jump on each other, laugh at inappropriate jokes and can’t seem to keep their arms and legs to themselves. And did I mention they are loud? I made the cake before heading out to dinner and a few games of laser skirmish. I took many, many photos. My husband took many, many photos. 13 year old boys move. Nearly all the photos turned our blurry. Someone, if not everyone, was moving at any given time. Below are the best out of the lot, and as you can see they aren’t that great! My 6 year old son was happy to get his dad all to himself and play a game of pool while the big boys laser battled (and came out arguing over who was the best shot and argued again as the scores came up on the screen). Teased, poked and paid out on each other through dinner. Argued over who was the best at PS3. Who was going to sleep where. And what movie to watch. (And that last pic is of me hugging my son as he’s trying to squirm away). 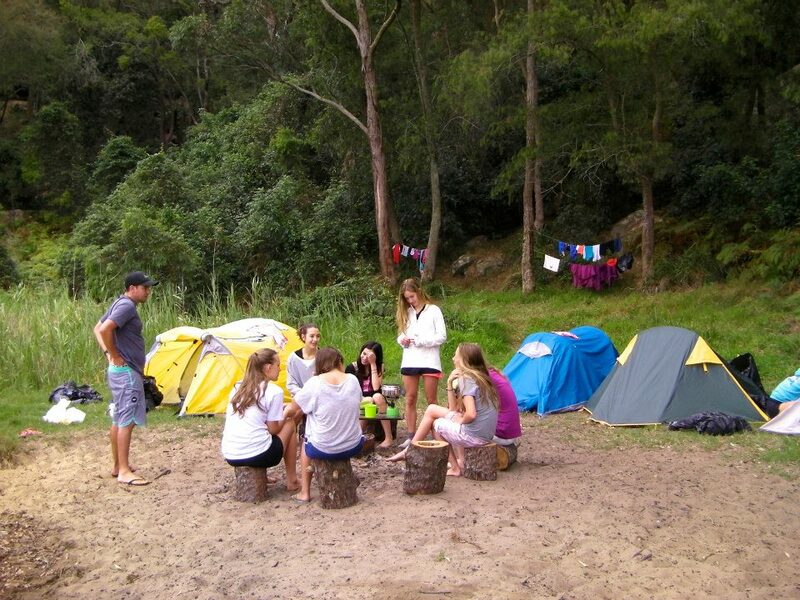 The next morning they woke us all up at the crack of dawn with more laughter and arguments. The early start however meant I could make the syrup and soak the cake before starting on pancakes for breakfast. 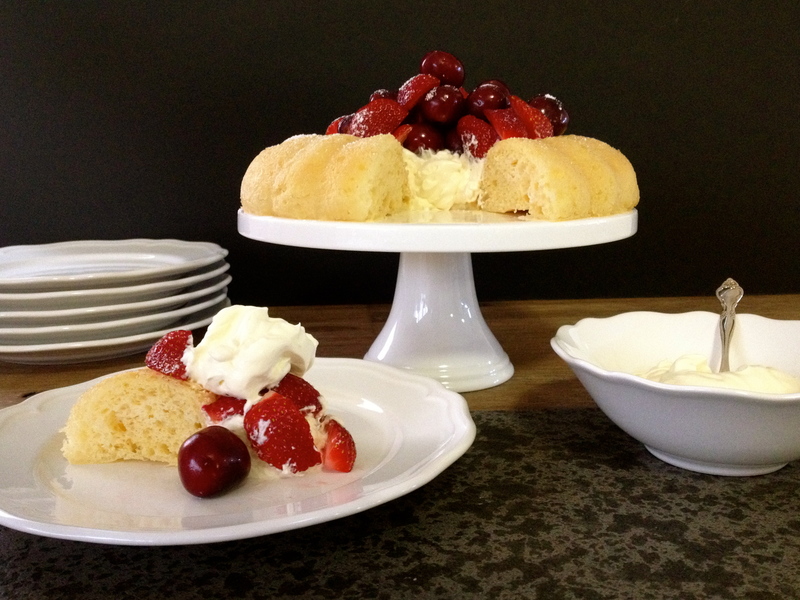 When they all went home, bleary eyed and tired (me and them), I filled the the middle of the cake with whipped cream and topped it off with fresh berries. The recipe calls for the berries to be mixed in raspberry puree however I prefer my berries fresh. And savoured each and every bite! (My husband wants me to mention he did most of the cleaning while I finished making the cake 🙂 !). I love baba cakes, so I thought this was wonderful. I preferred it with the pear eau-de-vie. The recipe of the cake can be found here. I am looking forward to see what the rest of the Tuesday with Dorie group thought of this cake! Tags: baking, cakes, cooking, family, food, my life, recipes, Tuesdays with Dorie | Permalink. I have always wanted to be persistent and consistent. Unfortunately my paved road lead me straight to the Game of Thrones. Week after week I would check the French Fridays with Dorie recipe schedule and set my intention to participate. Some weeks I simply noted the chosen recipe before returning to my books. Other weeks I went as far as buying the ingredients for the week’s recipe. There were a few weeks I made the recipe and then plain forgot to photograph it. And before I knew it, the weeks turned into months. Here I am, two months after my last post, thinking about how much fun I had making this week’s French Fridays with Dorie recipe and wondering why I had put off participating for so long?! Yes. I had to turn my back on a bunch of 13 year old boys running in out of the rain as they waged a full scale Nerf gun battle in my house, shooting anything that moved. But the grass, mud and odd bullet to the head was worth it! I am confident I would never have made Asparagus Soup if I wasn’t part of this group. I might have told myself “one day”… but I know I wouldn’t have. I would have missed out on cooking and sharing a delicious meal with my family. And also the sense of satisfaction and achievement that comes along with each recipe completed. 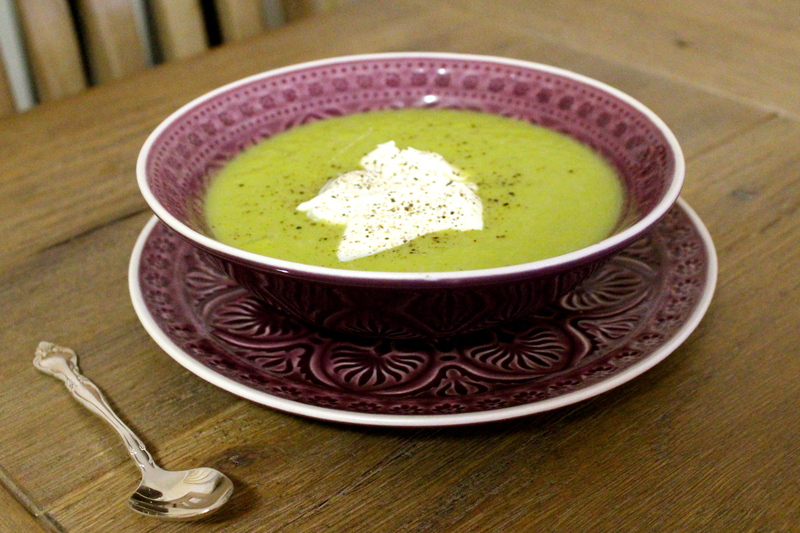 It’s coming into winter here in Australia, so we ate the soup warm with a dollop of creme fraiche. Yes. The kids pulled faces when they sat down to dinner and one confidently declared they were sure they weren’t going to like it! However they all tried it and they all changed their minds after tasting it! I am looking forward to catching up with the rest of the French Fridays with Dorie group on this recipe! Tags: asparagus, cooking, family, food, french food, french fridays with dorie, life, my life, soup | Permalink. It has been a long, long, while since I last posted. I have missed everything that goes along with producing a new post. The planning, the cooking, the photos and then putting it all together in some sort of presentable way! At some point, I think I decided that since it had been so long since I had done anything, I needed to do something really great to make up for it. That didn’t work out so well for me… so I did more of nothing! I became the poster child for procrastination. Then Tuesdays with Dorie: Baking with Julia scheduled Mocha Choc Chip Cookies for this week’s recipe. And I realised that simple was exactly what I needed. I put so much pressure on myself to come up with something amazing, I totally lost sight of the simple pleasures that make life special. So on the weekend I took out my baking pans and started. It had been so long, I actually felt a little anxious! Crazy, I know! However, as I started mixing the dough I began to enjoy myself. …and as soon as I pulled out one batch of cookies, my daughter and her friends ate them hot out of the oven on their way to make a video for their homework. The next batch my husband ate most of, on his own! The final batch I had to rescue from my boys and their friends who were running in and out of the house. Choc Chip Cookies came to my rescue! I can’t recommend these enough. For a sweet break (and for mental health)! 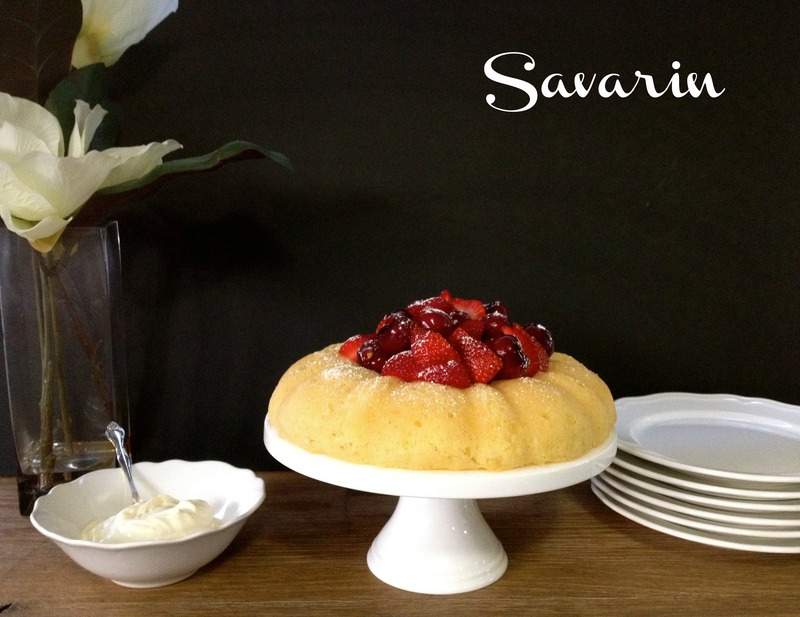 Please click over to Peggy at Galettista who has the full recipe on her site! Tags: baking, chocolate, cookies, cooking, family, food, recipes, Tuesdays with Dorie | Permalink. 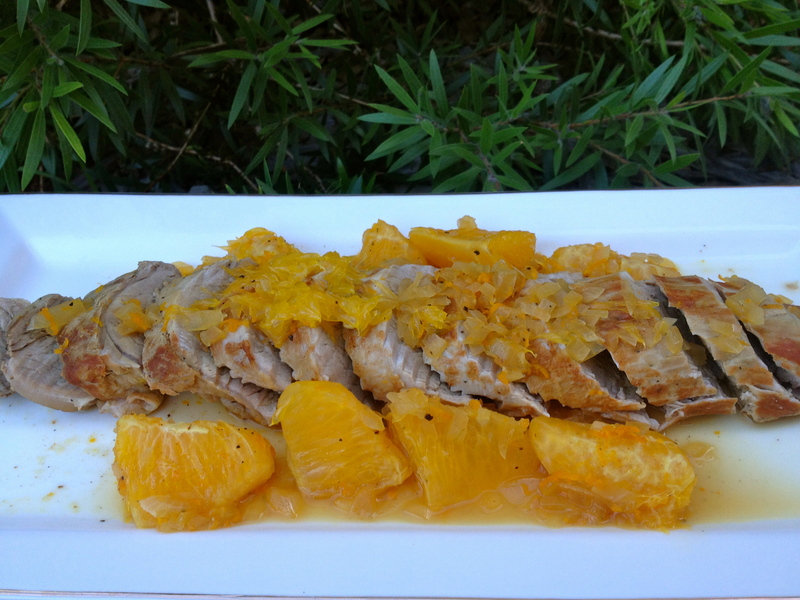 This week’s French Fridays with Dorie recipe was ‘Fresh Orange Pork Tenderloin’. I found this dish… I don’t know… plain? The meat itself was delicious. However I think this was due to the beautiful cut of meat I used. My older son started high school and they were off to camp in the second week. The day he returned from camp, was my little boy’s first day at school! I made the pork that night to celebrate and I served it with Dorie’s Potato Gratin which they love! We scraped the oranges off the pork and enjoyed it alongside the gratin. 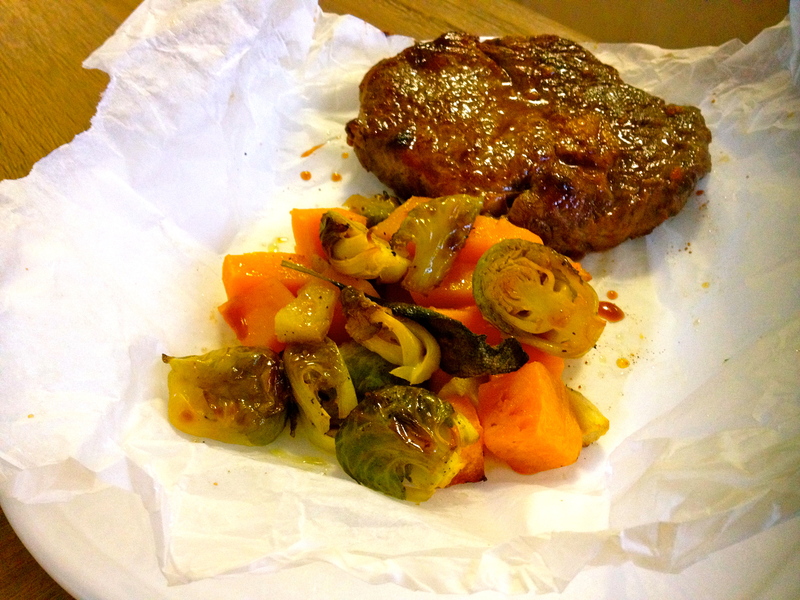 With all the start of new year craziness, I made last week’s recipe, the brown sugar squash and brussels sprouts en papilotte, however I did not get around to posting it! Again, I have to say the recipe, was nice, but nothing special. I’m glad I tried both of the recipes above. I’ve noticed if I tell my guys at home it’s a FFwD recipe, they just nod their heads and give it a go, no complaints, even if they don’t like it! I love how being part of this group has become a family affair! I’m looking forward to catching up and reading what the rest of the French Fridays with Dorie group thought of both recipes! Tags: baking, cooking, family, food, french fridays with dorie, my life, pork, vegetables | Permalink. But we all know where they lead you when there’s no actions to back them up! 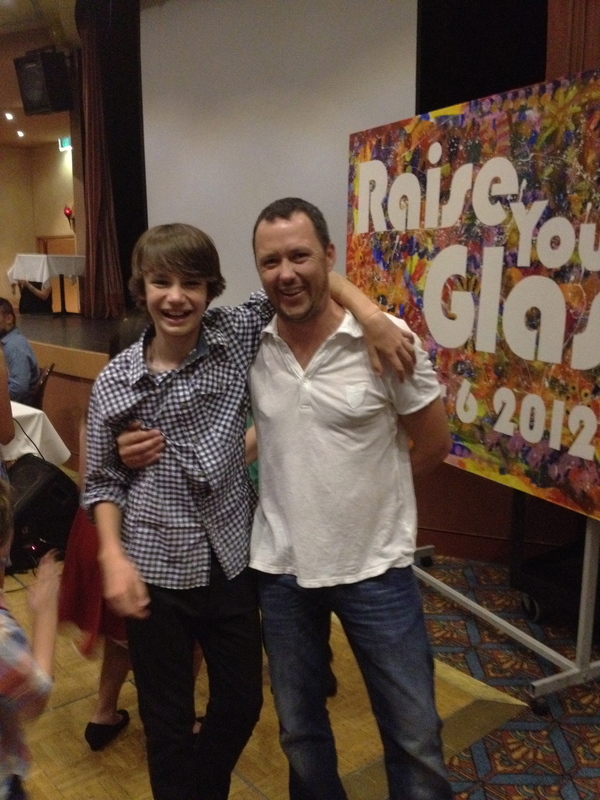 In addition to the usual holiday madness, I had my older son finishing his last year of primary school. After 7 years together (in Australia, kids start primary school when they are about 5 and complete a year of kindergarten followed by Years 1-6) my 12-yr-old son has now finished Year 6 and is off to high school where he will do Years 7-12! School ended December 19th, however those last few weeks were in full party mode. 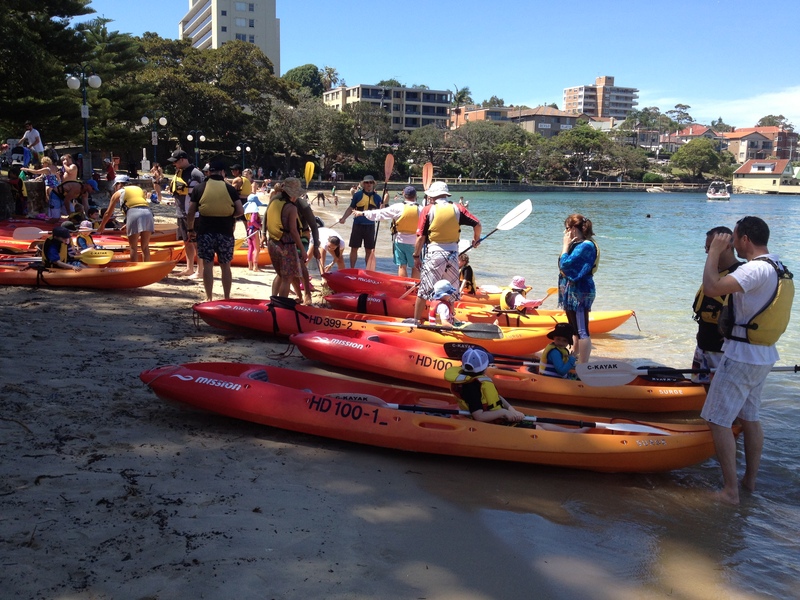 Surfing lessons, golf, tennis, camps, craft days, graduation ceremonies, concerts, dances and dinners were all arranged by the school. 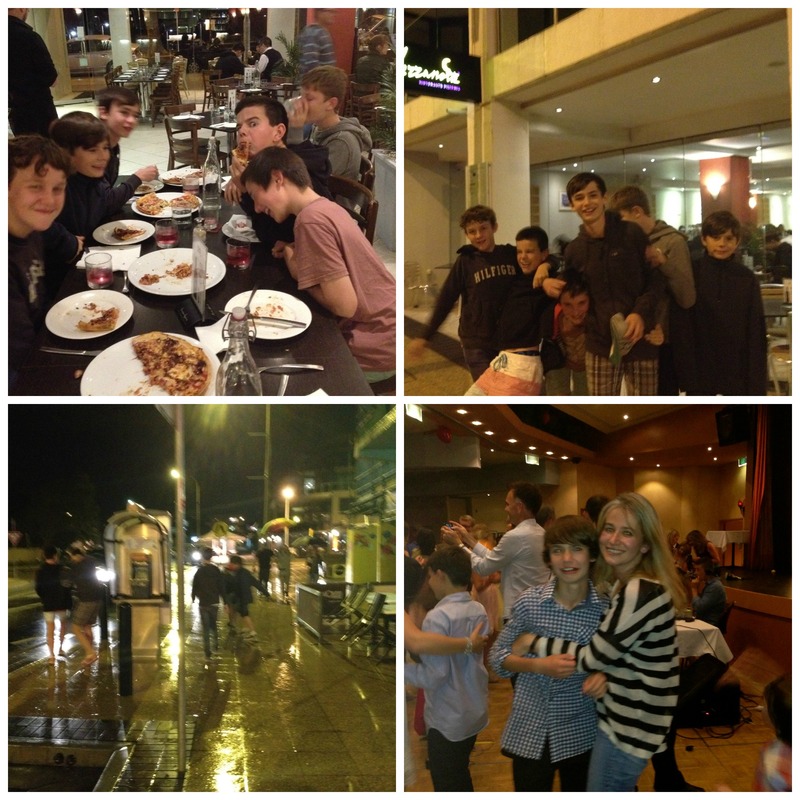 Then there were all the after school activities that the kids took to arranging for themselves on Skype and Instagram! 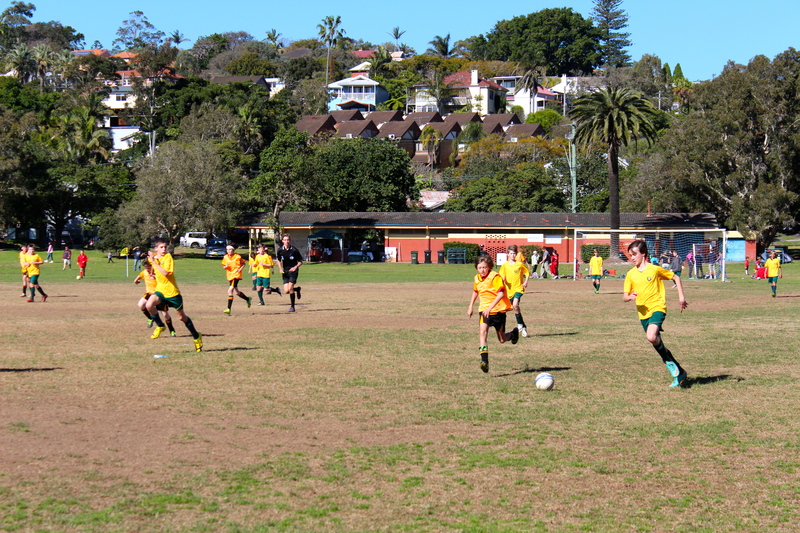 While the primary school was focused on sending their Year 6 kids off with a bunch of great memories, their respective high schools had their own orientation days and activities designed to welcome their new Year 7’s for 2013! And all this was just with one child! 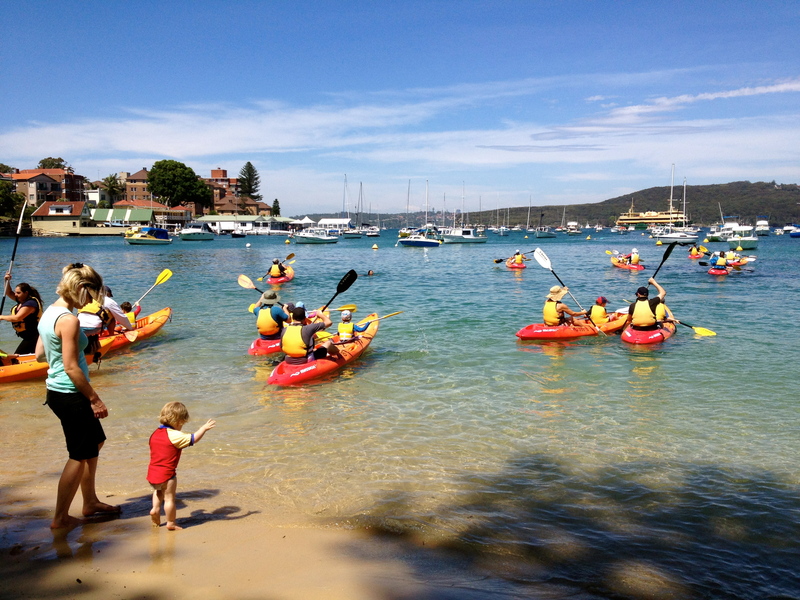 My younger son is starting primary school in 2013 so he had a series of orientation days of his own to attend and my daughter is undertaking the Duke of Edinburgh program which meant the last couple of weeks of school were spent getting organised for a kayaking/camping trip. Visions of myself baking Buche de Noels, Gingerbread houses, Christmas themed cookies, cakes and cupcakes went out of the window. This year, it felt like Christmas was eclipsed by… life. I didn’t even try to fight it. I just went with it. The kids return to school January 30th and we usually go away for a couple of weeks at some point over this 6-week break, however this year we decided to stay in Sydney. And days like the one in the pics below, reminded me of what an awesome place we live in! Then returned to cool down with a swim and a picnic lunch. 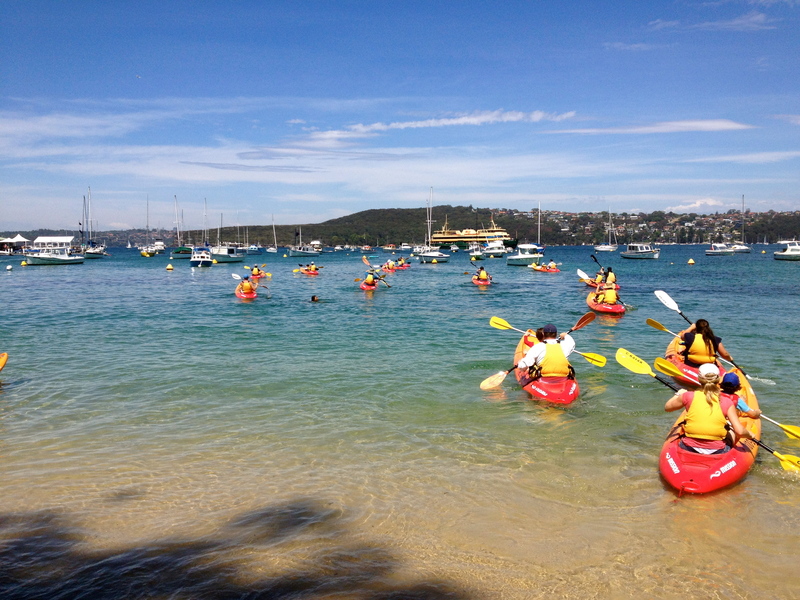 Today was a crazy 43 degrees celsius in Sydney. But yesterday was the perfect pizza making day! And so we kick start 2013 baking with Dorie and Julia! 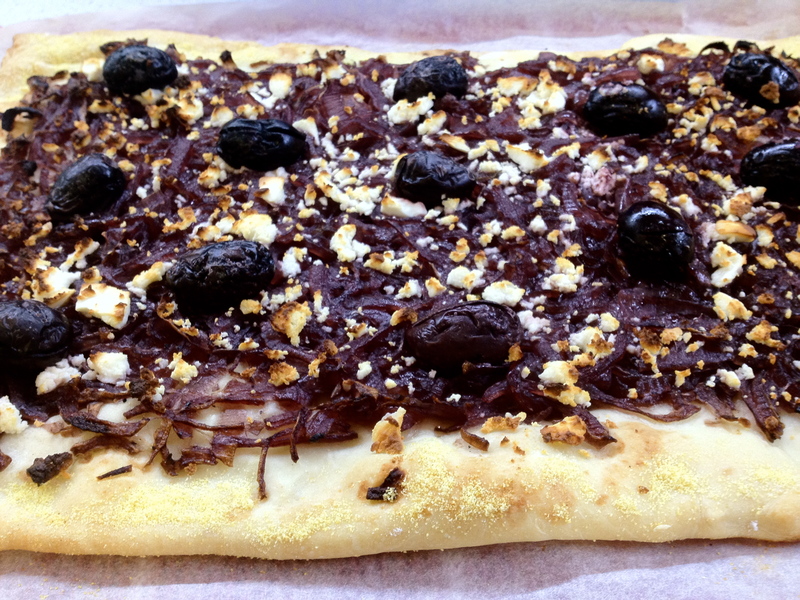 We all love olives and goat’s cheese in our family, so this recipe was enjoyed by everyone. 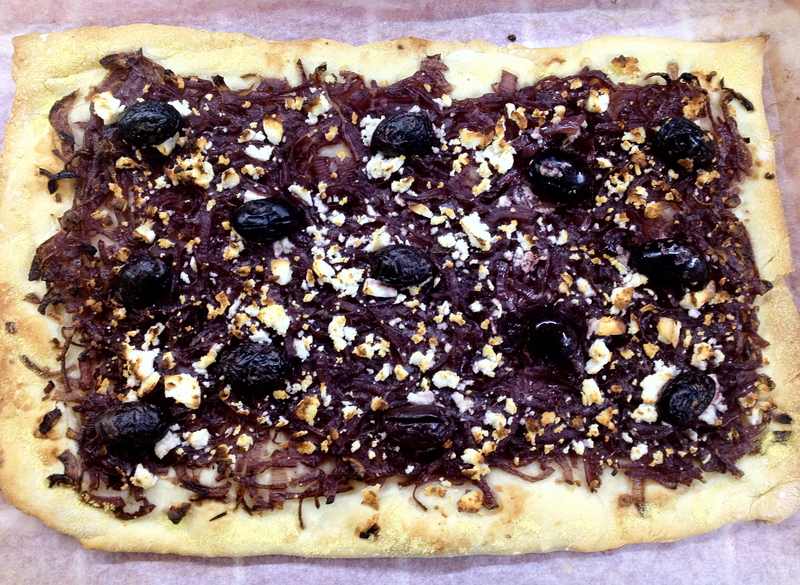 I have been wanting to make this for a while and I love the mix of the sweet onions with the salty olives and cheese. I thought it was perfect! This Tuesdays with Dorie recipe can be found in the book ‘Baking with Julia’ or by heading over to Paul’s blog ‘The Boy Can Bake’ . After a month away, I am looking forward to catching up on what everyone has been up to! Tags: baking, cooking, family, food, holidays, life, lifestyle, my life, personal, pizza, recipes, Tuesdays with Dorie | Permalink.